"No need to order take-out !! Make this quick and easy favorite the whole family will love." Heat oil in large skillet on medium-high heat. Add chicken; cook and stir 4 minutes or until cooked through. 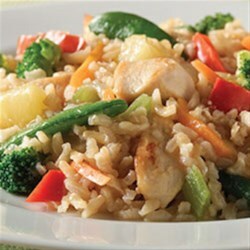 Add vegetables, pineapple with juice and sweet and sour sauce; mix well. Stir in water. Bring to boil. Stir in rice; cover. Reduce heat to medium-low; simmer 5 minutes. Remove from heat. Let stand 5 minutes or until almost all of the liquid is absorbed and rice is tender. This was sooo easy to make!! I love recipes like that! Plus, my Husband loved it! Bonus is you can use any combo of veggies that you like! Super easy to make and my picky eater kids loved it! Planning to add this to our meal rotation. I made brown rice separately rather than cooking it with the rice. This was a great recipe. I did add a little more sweet and Sour Sauce. It was even better re heated. used real long-grain rice as a bed,,and put mixture on top !!! Adjusted more sauce to it !!! !